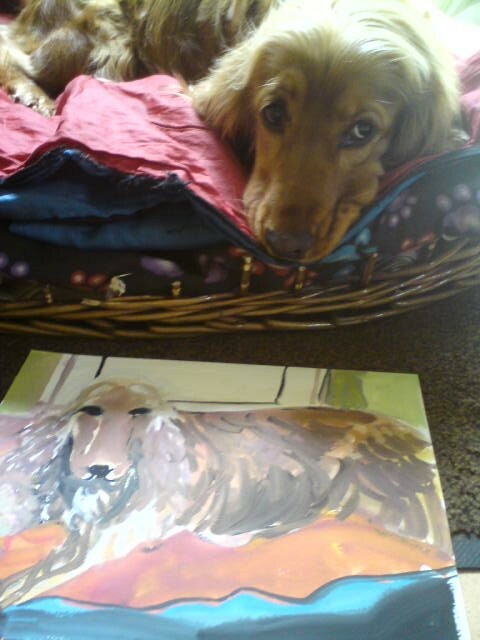 A couple of weeks ago we were recruiting cats and dogs who wanted to pose for visual artist Fiona Dowling. It was great to see that the interest was absolutely overwhelming. Fiona got stuck in France due to the volcanic ash cloud so after some rescheduling with all the cats and dogs, Grace – Community Arts Administrator for Droichead – and Fiona went around to their homes for a creative visit of the cute pets, all of whom were waiting impatiently for their portraits to be made. Grace enthusiastically told me all about her days out with the artist and the pets. Ireland is a nation of pet lovers; plenty people wanted to get a portrait made of their cat or dog. Unfortunately it was impossible to pay all the pets a visit. Sixteen pets and their owners got lucky and were delighted to welcome Grace and Fiona in their houses. Some of them even brought their pets to the groomer on the day beforehand, making sure they would be in their Sunday best for this special occasion. 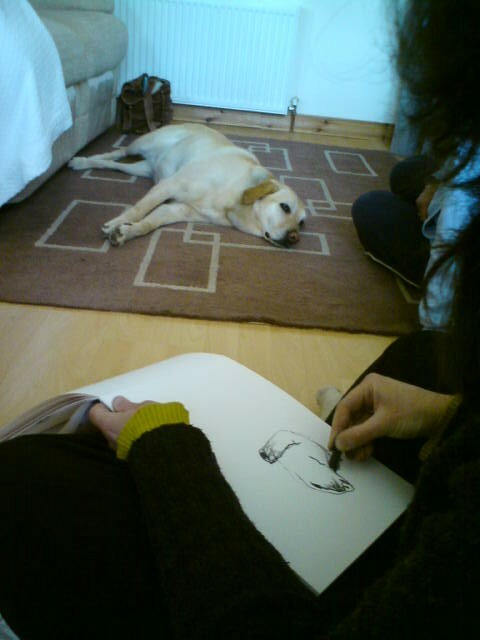 Each session was about 2 hours long and Fiona managed to make approximately 6 drawings of each pet, using a range of materials such as charcoal and gouaches. All the participating pets and their owners will receive a coloured copy of their favourite drawing. The cats and dogs behaved very well. 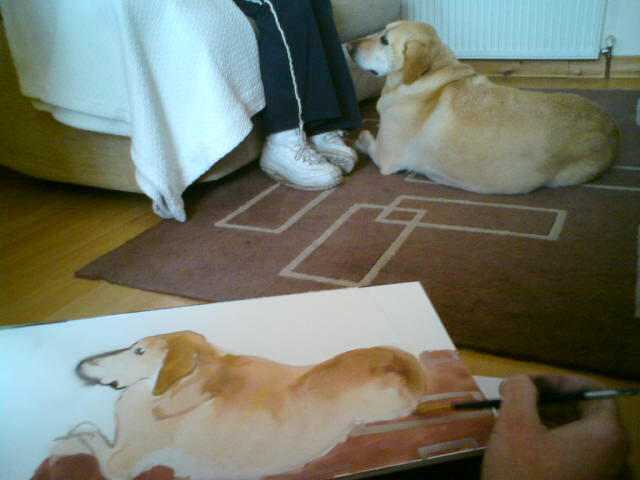 The first ten minutes were usually a bit awkward, because the pets got all excited and enthusiastic when Fiona and Grace arrived, so they wouldn’t sit still, which of course is an important aspect of posing for a painting. After a little while of ignoring them, hoping they would find a place to relax, the drawing and painting session could begin. 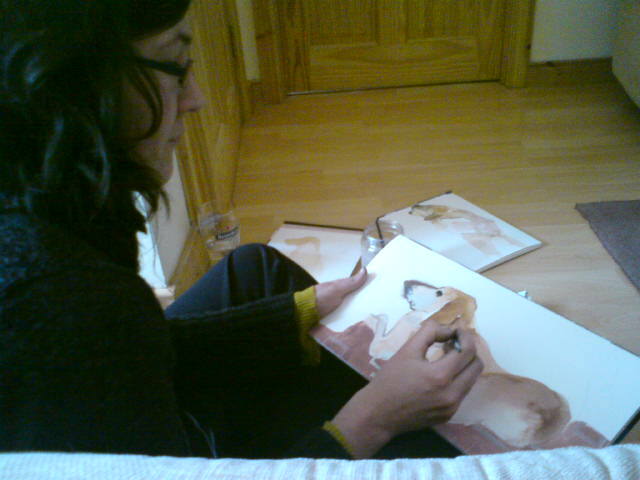 Fiona was sitting on floors, carpets, window sills and in awkward positions in order to get the composition of each piece right. One naughty dog kept hiding and another cat managed to always get into a position of only showing her arse to the artist. Funny situations indeed, but that is what makes such a project special in its own way. Fiona’s exhibition “We have all the time in the world” will be about love in all its different aspects. Visiting pets and their owners in their natural environment is, according to the artist, an interesting and original way to express the love between them. Interested in seeing the lovely paintings and drawings of these pets and many more beautiful pieces of art? The exhibition will be on in Droichead Arts Centre, Stockwell Street, from the 4th of July until the 6th of August. This entry was posted on May 21, 2010 at 11:00 am and is filed under Comings ang goings of Droichead, Visual Arts. You can follow any responses to this entry through the RSS 2.0 feed. You can leave a response, or trackback from your own site.